Driving is so 2017. It’s time to tie those laces and embrace a new form of transport: cycling. Because if a dog can do it, so can you. You don’t have to be Lance Armstrong to make the most of the bike paths in Melbourne. It’s one of the most bike-friendly cities in Australia. So buckle your helmet and treat yourself to some fresh air and scenic views with these 5 great bike rides in Melbourne. Mount your bike and make a day of it with the Capital City Trail, circling the city centre and some inner-eastern and northern suburbs of Melbourne. This 29km-return cycling journey is a must for all Melbourne newbies looking to embrace their inner tourist and explore the city’s historical and iconic landmarks, including Fed Square, The Docklands, Melbourne Zoo, and The Royal Botanical Gardens – not to mention some trendy cafés along the way. We recommend starting and finishing at Southbank. A leisurely (but lengthy) ride ticking some major Melbourne attractions off your bucket list. If an escape from the inner city is your kind of cycling adventure, treat your tyres to the Bay Trail. 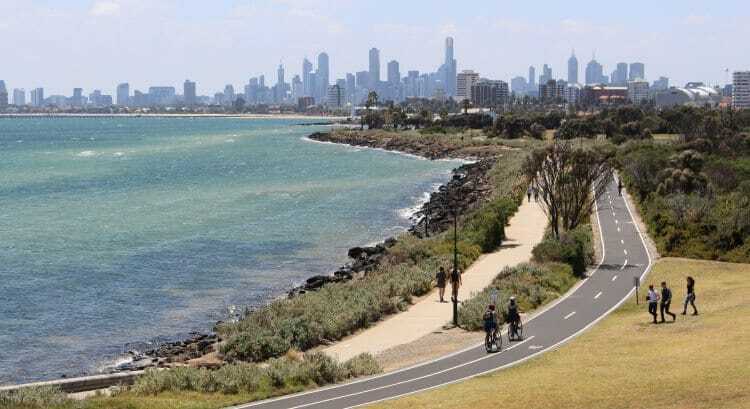 A pleasant ride for all ages and fitness levels, this easy 12km-return bike path follows the coastline of Port Phillip Bay through the southeastern suburbs, running from Luna Park at St Kilda to beautiful bayside Brighton. Embrace the salty air and take some seaside snaps for your socials, then sink your teeth into some fresh fish and chips before hitting the road for your return trip. A short, relaxing ride with ocean views. If you fancy your bike ride with a side of culture, this leafy 5km cycling track is sure to leave you feeling inspired. Running from Banksia Park to the Heide Sculpture Park, you can enjoy picture-perfect views of fruit trees and gums until you come across some of the city’s most iconic contemporary sculptures among beautiful landscaped gardens. A unique date or weekend activity with the kids. To truly feel like you’re out of the city and surrounded by nature, the Merri Creek Trail is a wonderland of native plants, weeping willows, and horse paddocks. This 20km path winds from one side of the Merri Creek bank all the way to the Yarra. It passes Coburg Lake Reserve, the Brunswick Velodrome, and CERES Community Environment Park along the way, so be sure to pack a picnic and find a quiet spot to take a break and take it all in. And if you don’t feel like riding the 20km back, bikes are allowed on all metropolitan trains in Melbourne free of charge. Couples or families wanting an active day outdoors. Farmlands, forests, and wineries? Yes please. The Lilydale to Warburton Rail Trail is a longer ride (40km one way) that takes you past stunning mountain scenery and acreage right through the vineyards of the Yarra Valley. If you ever needed a justification for enjoying a glass or four of the local drop, we think a 40km bike ride is just the ticket. A romantic day out, or a unique bachelorette party idea. And when you’re ready to close the curtain on your noble 2-wheeled steed for a while, keep it safe and out of the way in one of our self-storage units in Melbourne.